When I’m at work I like listening to music… but I hate being tethered to my computer (or iPod dock, or whatever) by the headphone cord. If I want to slide my chair over to the whiteboard to write something up or reach over and get something out of my bag, I have one of two choices: make the cord so long that it gets tangled up on my chair and in my desk stuff; or take the headphones off to go do whatever it is and put them back on. Also, I like my headphones. I have some ear buds, I have some over-the-ear headphones, and while they’re not bajillion-dollar models, I like them. I don’t want Yet Another Pair of Headphones that are wireless. I want to use my headphones. The ones I already own. Before I explain this, let the audiophiles be warned: This doesn’t yield super-awesome quality. But then again, I’m not sure I’d call music-over-Bluetooth on any level “super-awesome.” Just be aware. First, get a Bluetooth audio dongle receiver like the TaoTronics BTI-005. That’s the one I got and it seems to work pretty well. This runs between $20 and $30 at the time of this writing. There are a few of these dongles out there, but on Amazon right now this one is the most popular and is one of the few that doesn’t also require you to plug it in. The audio receiver allows you to plug your existing headphones in and it will receive any audio played over Bluetooth through those headphones. You just converted your headphones to Bluetooth. The thing is, you may or may not be done. If your audio source (iPod, etc.) supports Bluetooth, you’re probably done. Pair it up and listen to a song. See how the quality is. If the quality is pretty good on your Bluetooth audio source, you’re done. In this case, you also need a Bluetooth audio transmitter dongle. I bought the JayBird uSport Bluetooth adapter for 3.5mm devices. 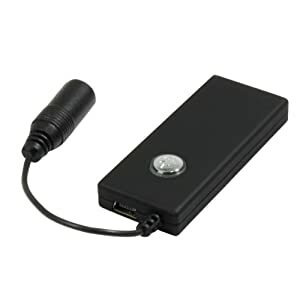 What this does is plug into the headset jack on your audio source (computer, iPod, phone, etc.) and sends the audio signal via Bluetooth. Pair that up with your receiver dongle and you have both pieces to the puzzle covered – the transmitter and the receiver. 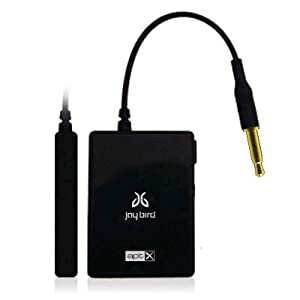 Again, there are different transmitters out there, but this one seems pretty popular and supports this new protocol called “apt-X” that allows you to potentially get a better audio quality if you also use a receiver with “apt-X.” You can also try the TaoTronics TT-BA01 adapter for 3.5mm devices, which will probably work. I wanted the upgrade-ability, so I went with the JayBird. I’m listening to Pandora through my computer using the BTI-005/JayBird uSport combo right now and it’s decent. Is it audiophile quality? No, but it’s decent. Given that it’s compressed music streaming over the internet and into a mediocre pair of headphones… I don’t think the Bluetooth portion of things is that noticeable. When there’s a gap between songs or a really quiet section of a song, I do hear a low-level “buzzing” background noise. But for what I’m doing… it’s good enough.